NEW YORK, NY (September 12, 2018) - The Women’s Media Group hosted a panel, ‘Leveraging Trends in Audiobook Publishing’ featuring audiobook leaders and pioneers including: Beth Anderson, Audible EVP and Publisher; Nita Basu, Senior Marketing and Publicity Coordinator, Hachette Audio; Amanda D’Acierno, President and Publisher, Penguin Random House Audio Publishing Group; and Mary Beth Roche, President and Publisher, Macmillan Audio; moderated by Robin Whitten of AudioFile magazine. “Audiobooks are here. I no longer have to explain what audiobooks are,” said Robin Whitten, who founded AudioFile magazine 25 years ago, as she introduced the panel. ”Audiobooks are the top publishing format of the year” she said, and cited an increase in both the number of audiobooks published, from 12,000 audiobooks published in 2012 to over 46,000 audio books published in 2017, and a 22% growth in sales dollars in 2017. Asked where the next areas of growth and opportunity for audiobooks might be, Anderson said that smart speakers, meaning devices such as Alexa and Google Home, are an “exciting space to watch” and that she foresees growth in children’s books and in the international and global markets as well. “When is it a podcast, when is it an audiobook? They're complementary - some audiobooks are now launched as podcasts” she said. Panelists were asked about exciting new and forthcoming audiobooks. Books mentioned included memoirs from Michelle Obama, the Beastie Boys, Sally Field, Roger Daltrey, and a performance by Patti Smith. Mary Beth Roche was excited about the novels Baby Teeth by Zoje Sage, and The Night Tiger by Yangsze Choo, and gave away free audiobook download cards of the books to attendees of the luncheon. Robin Whitten of AudioFile magazine is enthusiastic about her new podcast called ‘Behind the Mic with AudioFile Magazine.’ The podcast is a different format for her for covering the world of audiobooks. Also mentioned was a Stormy Daniels memoir coming out next month, news of which had been announced on ABC’s The View earlier in the day. The book, Full Disclosure, will be published by St. Martin’s Press. Another audiobooks news item mentioned by the panel was that new Apple Watch will be audiobook compatible. That news served to underscore an underlying theme of the luncheon, that the audiobooks boom is and will be taking place in all sorts of spaces - from phones to watches, to smart speakers to cars. The Women’s Media Group, founded in 1973, is a New York-based nonprofit association of women who have achieved prominence in many fields of media. Its 250-plus members, drawn from book, magazine, and newspaper publishing; film, television, online and other digital media, meet, collaborate, inform and support one another as well as mentor young women interested in publishing careers. It seeks to advance the position of all women through the power of communication and media. It provides a forum for networking, career development and advocacy. Activities include monthly meetings, seminars, cultural events. The group also runs a college fellowship for minority women. WMG is proud of the accomplishments and diversity of its members and seeks to advance the position of all women through the power of communication and media. NEW YORK, NY (August 8, 2018) - The Women’s Media Group announced the recipients of its 2018 Fellowship, created to support young women of color who are interested in publishing careers. Two women were honored during a luncheon which took place at the Upper Story restaurant in New York City on June 14, 2018. The fellowships were presented by Miral Sattar of Bibliocrunch, who is WMG’s Co-President, along with Dee Dee De Bartlo of De Bartlo & Co. In recent years, WMG has partnered with Retha Powers, Assistant Director of the Publishing Certificate Program (PCP) at the City College of New York, to identify students who show exceptional promise and a strong commitment to working in media. Fellowship recipients receive invitations to WMG events over the summer, one-on-one mentoring from its members, and a stipend to help cover living costs, among other benefits. 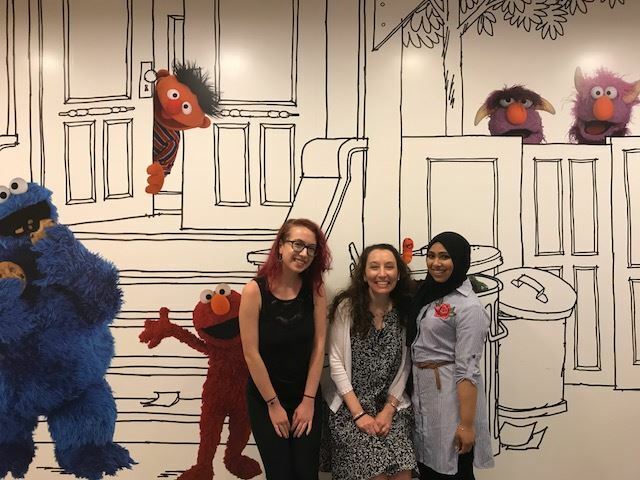 Worldwide Publishing at Sesame Workshop was host to the Women’s Media Group Fellowship recipients for a one-day mentorship focused on licensed publishing. l. to r.: Aurora Soriano, Jennifer A. Perry of Worldwide Publishing / Sesame Workshop, and Tahmena Hussain. TAHMENA HUSSAIN graduated from The City College of New York, with a B.A. in English Creative Writing. She has been on the Dean's List, 2016, and her attention to detail in her writing earned her The David Markowitz Essay Award, 2017. Shortly after graduation, Tahmena interned at Penguin Random House with Penguin Young Readers Group in the publicity department writing pitch letters, researching bloggers and media outlets, and drafting itineraries for author tours. AURORA SORIANO is an English Literature major and Theatre minor at the City College of New York, where she is also enrolled in the Publishing Certificate Program. She is an English Honors student, and loves reading both contemporary YA novels and classic literature. Aurora is the current feature editor and a staff writer for CCNY's magazine The Campus, and is interning with the Children's Department of McIntosh & Otis this summer. Tessa Shanks, Business Manager, W. W. Norton & Co., Inc.
“We look forward to mentoring and working with these outstanding young women and we hope to contribute to more diversity in the book industry by welcoming them into our community,” said Miral Sattar, Co-President of WMG. The Women's Media Group provides a forum for networking, career development and advocacy. Activities include monthly meetings, seminars, cultural events. The group also runs a college fellowship for minority women.